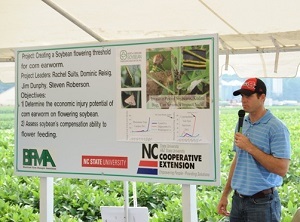 This is the second in short series of posts on blueberry pollination. A diverse group of bees pollinate blueberries in North Carolina. During the past three years, one the focuses of in our lab has been to understand the relative importance of the different bees for blueberry pollination. When we initially set out to assess pollinators in blueberries, our goals were both to determine which species were present and how important each species was for fruit production. This second goal, identifying which bees are the “best” blueberry pollinators, is more complicated than it might seem. In a recently published paper, recent graduate Shelley Rogers highlights five criteria for evaluating pollinator performance: abundance, per-visit efficency, activity pattern, visitation rate, and species interactions. Our last post described differences in honey bee and bumble bee responses to interactions on artificial flowers, and the possible implications for pollinator performance. 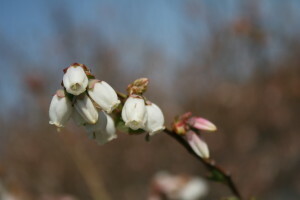 We bee communities and pollination at four commerical blueberry fields during 2010 and 2011. Here, we’ll highlight findings for the other four critera. Honey bees were stocked at all of the sites we visited, and not surprisingly, were the most abundant species present. Southeastern blueberry bees were also present in relatively large numbers across sites and were notable in their abundance early in the bloom period. Bumble bees, carpenter bees, and “small native bees” (the most common of which was Andrena bradleyi) were less abundant. Osmia cornifrons, commonly referred to as the hornfaced bee or orchard bee, was very abundant at one site in western North Carolina, but absent from the other three sites. A single visit by a small native bee, which could not be distinguished to species on the wing, resulted in the highest seed set, but single visits by bumble bees and hornfaced bees also resulted in high seed set. Both honey bee and southeastern blueberry bee visits produced relatively few seeds. Honey bees were less abundant on cloudy, cool, and windy days, but other bee groups were not negatively impacted by weather. We did not quantify visitation rate at our sites, but other studies have measured this variable. Southeastern blueberry bees had the shortest handling time of all blueberry pollinators (see Rogers, et al. for references), meaning they could potentially visit more flowers in a shorter period. Casual observations at our sites suggest that some of the small native bees may have very long handling times. We often observed them crawling inside blueberry corollas while foraging. So which bees are the best blueberry pollinators? It depends on how “best” is defined. Small native bees and bumble bees produce the most seeds in a single visit, but there are fewer of them in blueberry fields. Honey bees are abundant, but they are less active when the weather is poor and produce fewer seeds in a single visit. Southeastern blueberry bees are active early in the year and abundant across sites, and although they produce fewer seeds in a single visit, their visits are fast. Because no single bee species produces high numbers of seeds, is present in large numbers (either naturally or through man-made augmentation), is active under all weather conditions, and visits lots of flowers quickly, we need a diversity of bees to produce the most blueberries. Our future research activites will focus on relating bee diversity to crop value and production practices so that we can make recommendations to growers both as to what bees they should foster on their farm as well as what management practices to avoid and enhance.